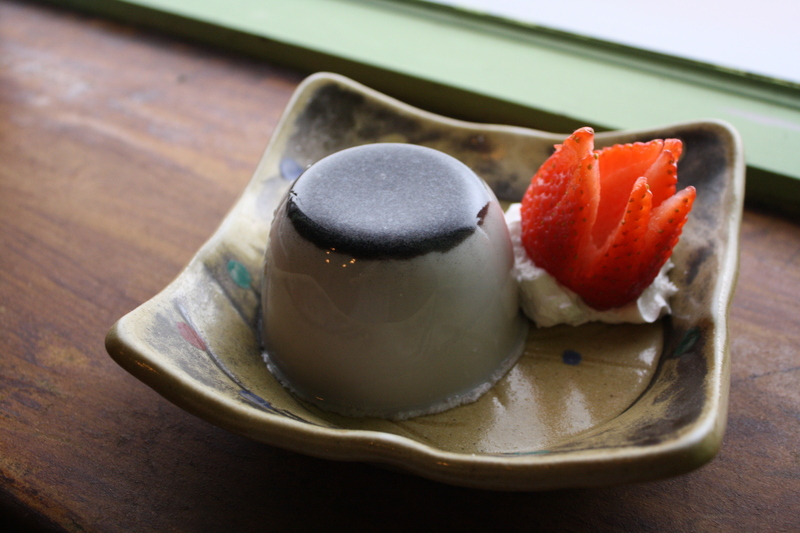 Black sesame mousse from Tei-An. Photo by Catherine Downes. Red bean and matcha should watch their backs. I remember eating black sesame for the first time. I was just a small child, restlessly perched at the table, waiting for my parents and their posse of good friends to finally wrap up one of their rambunctious family dinners. My mom set down a bowl filled with little bloated white rice balls submerged in a clear sugary broth. She called them “tang yuan,” a quintessential Chinese dessert that’s traditionally served during the Lunar New Year. I poked and prodded them with the tip of my chopstick and I managed to rip open one of the silky, glutinous skins. Horror. Horror ensued. A black swampy sludge oozed into the cradle of my soup spoon and it dawned on me: my mother was trying to kill me with this dumpling from hell. But at her stern insistence, I tried it. Just a lick. And the glee was almost instantaneous. Black sesame, I’ll admit, is not pretty and if you’re new to Asian ingredients, it can be downright unsettling. But fear not, it’s everything but. It’s sweet, nutty, unctuous—a bit like peanut butter, but better. Black sesame (and tang yuan) have since become one of the many things I associate with my childhood, and it has made the rounds on Asian dinner tables for generations. While most Chinese kids like me are accustomed to that swampy sludge, black sesame has since been reimagined into several new delicious forms. It has grown silently across the Dallas food scene in recent years, and those who love black sesame know it’s got great potential to be the next big thing in contemporary Asian desserts. 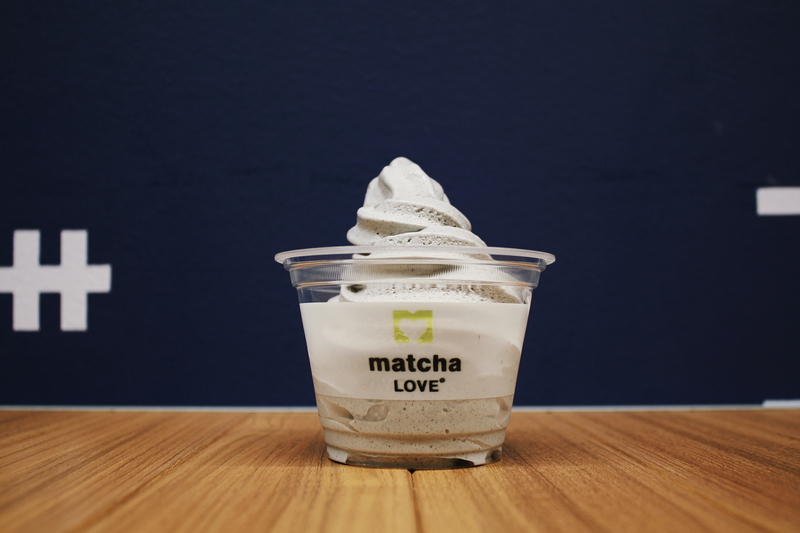 “I definitely see it becoming mainstream as we’ve seen with so many Asian ingredients—much like wasabi, Sriracha, miso and matcha,” says Rona Tison, a spokesperson for Matcha Love, whose black sesame soft-serve is featured in this list. Here are some places across North Texas that have taken black sesame to new heights. Located inside the Mitsuwa Marketplace food court in Plano, Matcha Love lures lines of people with its unique menu–and its bright green digs. Though Matcha Love is a global leader in green tea, its soft-serve ice cream has quickly ascended the ranks. They offer just four flavors: Madagascar Vanilla, Matcha Green Tea, Hojicha Green Tea and Black Sesame. And while they’re all equally delicious, the black sesame really shines. “Just the fact that it is black in color is intriguing and gives it an allure,” says Rona Tison. “Customers enjoy ordering both the matcha and black sesame because the contrast of the two colors is fun and dramatic.” I’ll attest to that. At Neulbom, milk snow is the star. If you’ve never had “snow” before, it’s exactly what it sounds like: shaved ice that’s so fluffy and delicate, it’s like an alpine ski trip in your mouth. Neulbom offers 10 types of snow–from sweet red bean to mango–but the black sesame milk snow is a customer favorite. The bold nuttiness of black sesame is tempered nicely by the shaved ice, and it’s topped with red bean paste, nuts, and mochi for texture. All of that is piled high in a giant tea cup. While you’re there, also grab their black sesame latte. That is, if you’re not black-sesamed out by now. Tei-An may be known for its soba noodles, but it’s actually the desserts that make this downtown Dallas joint unforgettable. It’s got everything from soba ice cream–served atop a pool of black honey and soy powder–to a decadent Tiramisu. But if you’re looking for a lighter alternative, the black sesame mousse delivers. It’s a harmonious marriage of airiness and depth of flavor, and it comes with a dollop of whipped cream and a brittle butter cookie, all spooned into an earthenware teacup. This dessert is as simple and elegant as the restaurant’s sleek interiors, and it shouldn’t be missed. My only complaint: it’s not served in a bucket. For me, ordering dessert at a restaurant is a rare moment of self-indulgence, so it’s likely in my years as a restaurant-going adult that I’ve missed out on some truly spectacular sweets. Well, Masami’s black sesame flan has reformed me. It’s everything you love about flan: it’s creamy, smooth and not too, too sweet. In fact, the subtlety of the flavors is this dessert’s best quality. The black sesame sits on the flan like a little top hat and infuses a warm, toasty nuttiness into each bite. It’s not what you’d expect to be the star of a sushi restaurant, but life is full of pleasant surprises. This dessert may seem disconcerting at first–being that it’s such a dark color and that it’s a soup–but Mango Mango’s black sesame paste soup is a true Chinese classic. It’s simple, crafted from a mere four ingredients: black sesame, rice, water, and sugar. And it’s served hot and with a generous helping of glutinous rice balls. Mango Mango, which has two locations in North Texas (one in Carrollton and another in Plano) is a dessert shop that hails from New York City’s Chinatown and pivots its menu around ingredients like red bean, sago and, of course, its namesake. The black sesame soup is a delectable blend of salty and sweet. And if you’re looking for a dessert to transport you to the winding alleyways of China or Hong Kong, this is it. The black sesame macaron at Chelles is not in the patisserie’s usual rotation, but it’s a real crowd pleaser when it makes its limited appearance. Owner Jonathan King gives his bakers plenty of creative liberty, and with that freedom, comes innovative interpretations of this classic French confection. 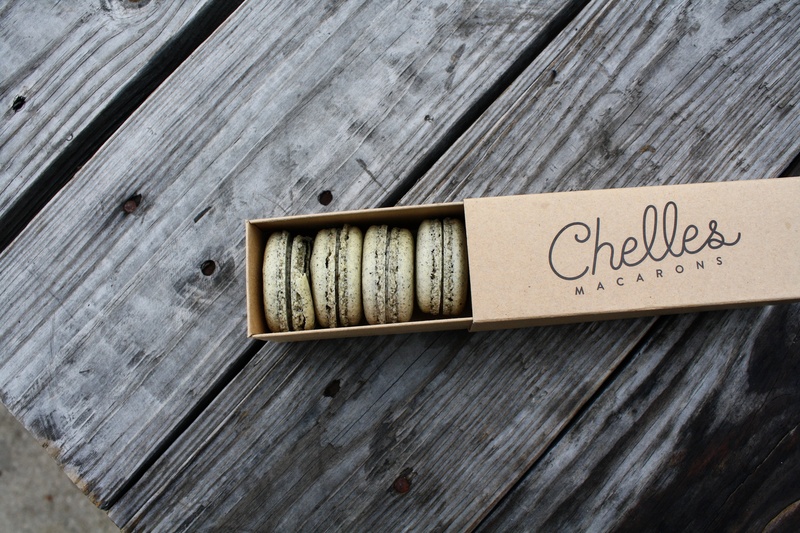 At Chelles, you can find the usuals: vanilla bean, pistachio and chocolate. But you can also find pecan pie, strawberry cheesecake, and cookies ‘n cream. The black sesame macaron, which is one of 18 seasonal flavors, is a nod to King’s Asian heritage. He, too, grew up eating tang yuan on cold nights. The black sesame is incorporated in both the filling and the shell, which King says can be tricky. “We still run into mystery batches that just don’t come out right. Macarons are definitely a humbling pastry to make.” The customers surely can’t tell. An informal survey of Chelles’ Yelp page shows that the black sesame is definitely the favorite. One customer even said it was “excellent, so much so that I had to go back the next day for more.” Grab one or a dozen at the Dallas Farmers Market or the Craft Kitchen in Plano. I grew up going to sushi restaurants in the suburbs and getting a tiny bowl of free ice cream for dessert. The choices were pretty standard for Asian cuisine: green tea or red bean. So I was so pleased to see Teppo not only offering black sesame ice cream but doing it so well, that it made me pine for that rich, velvety goodness for days. The ice cream has been described as a scoop of umami; savory, sweet and just all-round yummy. And like all irresistible ice creams, this one comes with a cookie. You can either set it aside or use it as a black sesame ice cream delivery vehicle. It won’t disappoint.